Before we attacked the toasts, we wanted to try their pasta. I had my eye on the Truffle Cream with Prosciutto, but my friends wanted to try the Metaiko Pasta (P265), which was also very much recommended by our host. 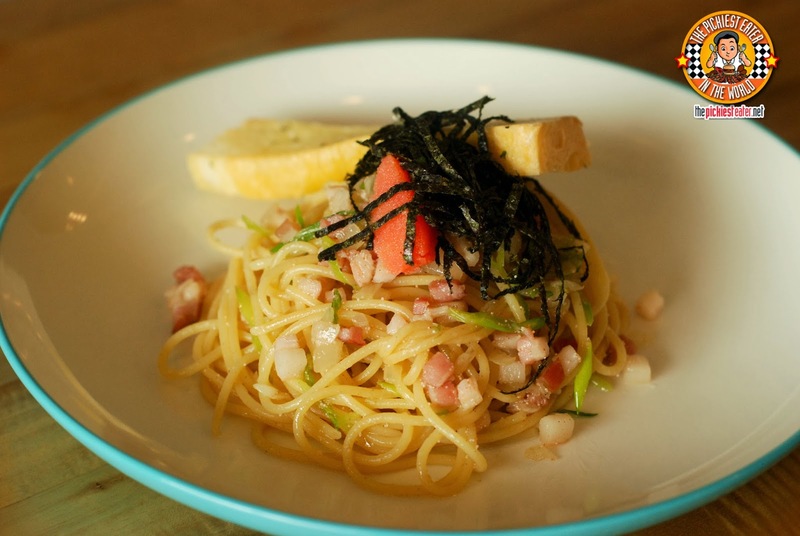 THe Mentaiko is a fusion of the best of two cultures, encapsulated in one plate of pasta. I love oil based pasta, and even though Cod Roe isn't something I particularly enjoy, the mix of it with the fatty bits of bacon made it more tolerable for me. And in case you were wondering, I brushed off the thin strips of Nori hehe.. 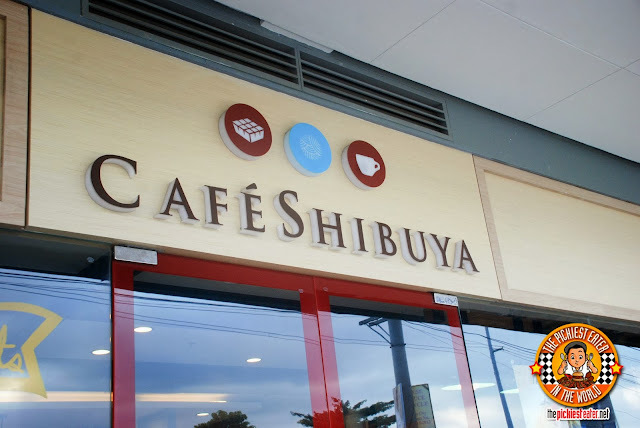 But we didn't go to Cafe Shibuya for the pastas. We were there for the toasts. We were determined to see if Cafe Shibuya would make believers out of us.. That a restaurant that sells "Toast" can thrive. 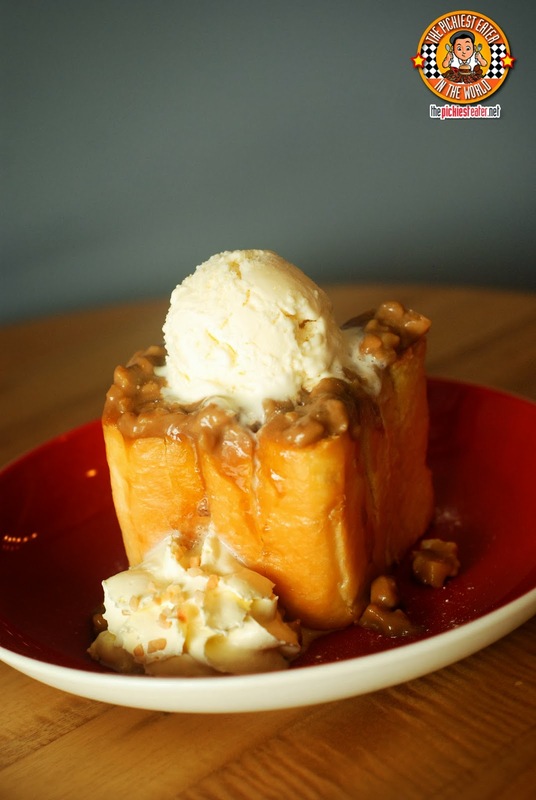 We decided to stick to the basics and try the Original Shibuya Honey Toast (Baby P145/ Regular P175) first. And guess what? 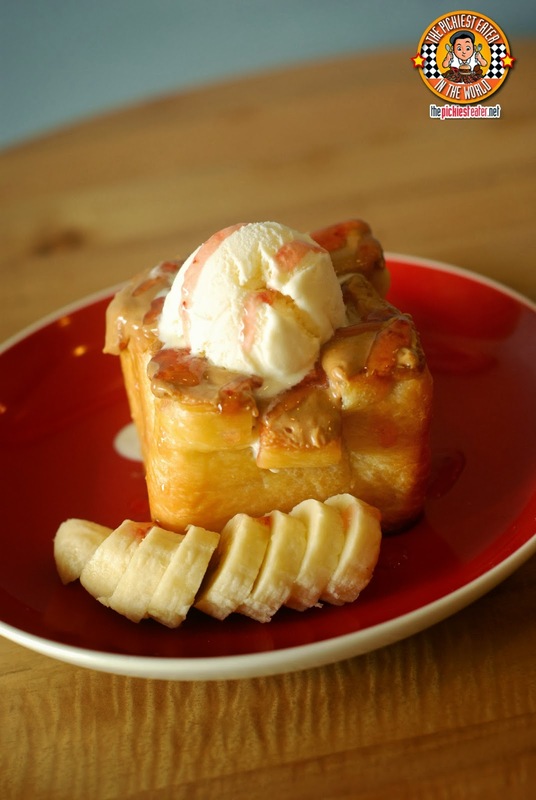 It took one bite for this stunning piece of toast to turn all of us food bloggers into believers. Any fear I may have had was shattered to smithereens. Lets this be known: It is the civic duty of anyone that makes toast this delicious to open a restaurant and let the general public be able to purchase this on demand. 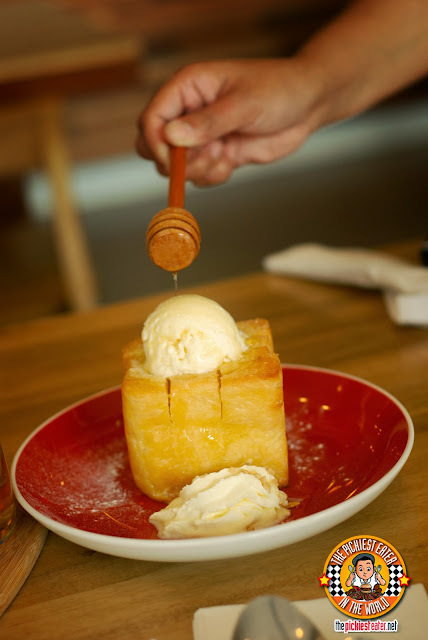 After our waitress drizzled generous helpings of Honey on to the top of the toast which was topped with a scoop of Vanilla Ice Cream, I gazed at it for a minute, and couldn't help but admire how gorgeous it was. I snapped out of my trance to dig into the toast, and I was blown away at how soft the bread was, despite the fact it was quite thick. The bread was cotton soft, and buttered with the right balance, that you never feel it becoming too rich. 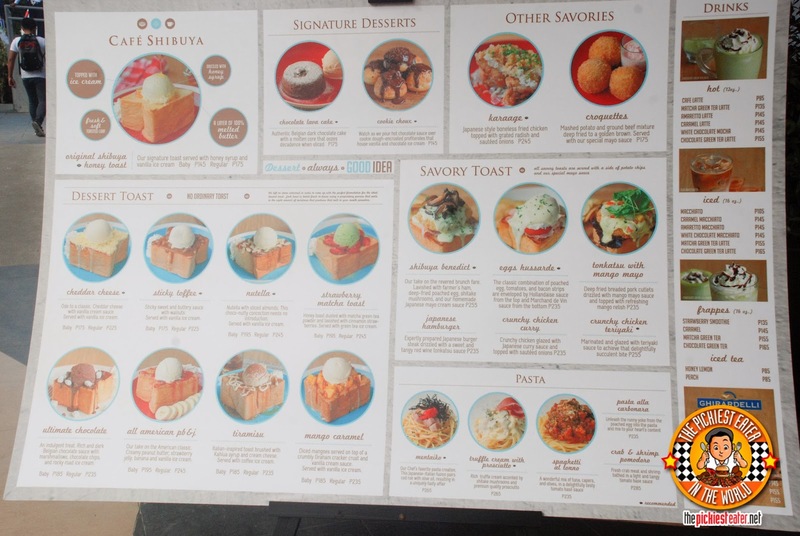 There are many variants of Cafe Shibuya's toast available, but the original one is still the one to beat. Among the toasts we would try, the one I liked least was the All American PB & J (Baby P195/ Regular P245). Don't get me wrong, the bread was still amazing, but I felt that it could have used a bit more strawberry jam to counter the richness of the peanut butter, and I think it frying the bananas, instead of just slicing up a raw one, would have added a little extra awesome. 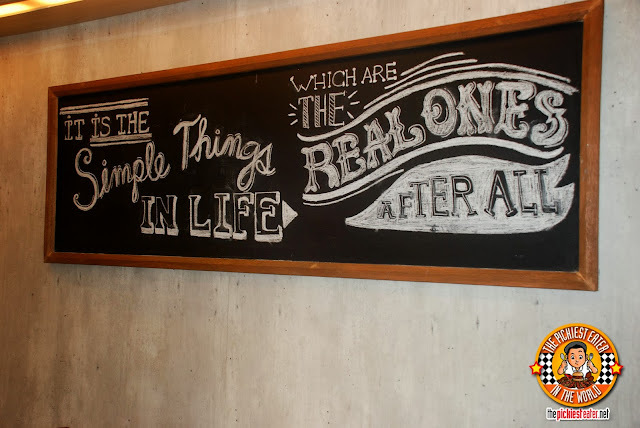 My personal choice to order was the Sticky Toffee (Baby P175/ Regular P225).. And I was not disappointed. I Loved the touch of sweetness of the toffee, tempered by the Vanilla Ice Cream, with the added crunch from the walnuts, melding perfectly with the delicious creaminess of the buttery toast. 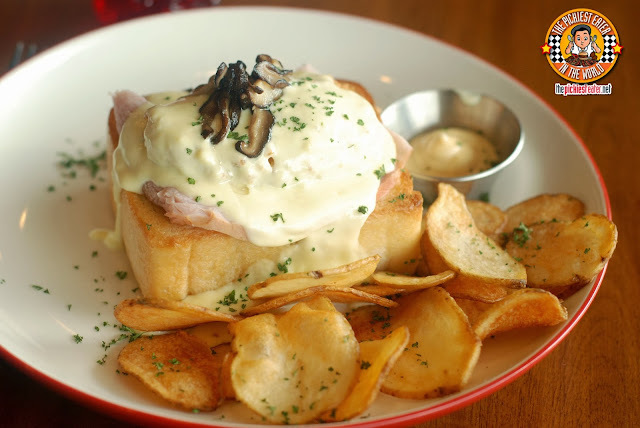 We decided to try one Savory toast, particularly the Shibuya Benedict (P255). This was phenomenal. As I was looking at toast, there was an element to it that I didn't recognize at first glance. Yes, the gorgeous slice of Farmers Ham was laid on Shibuya's signature buttered toast, smothered with a mayo cream sauce, and topped with shitake mushrooms, but there was something on top of it, that resembled a golden fried hashbrown. As my fork pierced through it, its identity was instantly revealed.. It was a poached egg, that was delicately coated in Japanese bread crumbs and deep fried, with the yolk breaking after being speared through by my fork. There are quite a few other savory toasts that I want to try, but I don't see how I can go back to Cafe Shibuya and not order this again. Cafe Shibuya, not only did you make a believer out of me, you may now consider me as devout as a screaming 13 year old girl at a Justin Bieber concert that he was four hours late for. 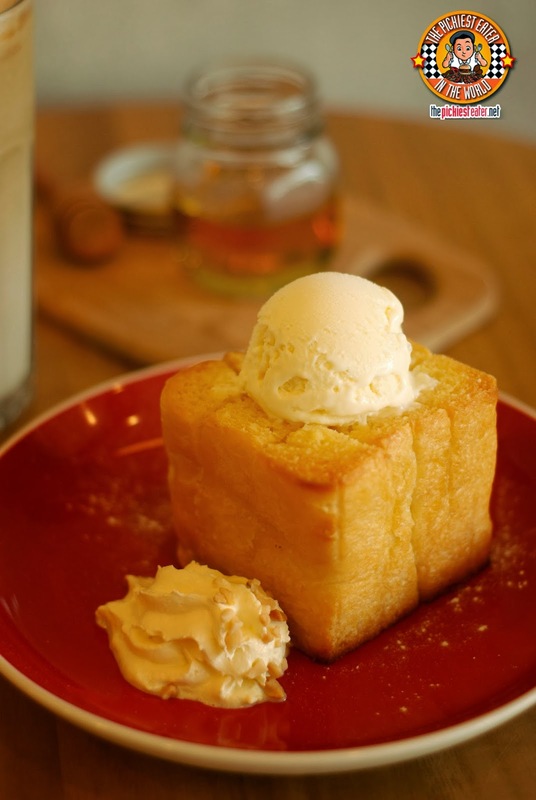 Any food lover should add tasting Shibuya's toasts to their list of places to try. I will definitely, without a shadow of a doubt, go back to taste their other dishes.. If I can resist not ordering the Benedict, Sticky Toffee and Original all over again!! Sayang, Edelweiza! Its worth the trip, though! A poached egg coated in breadcrumbs and deep-fried!? Amazing! 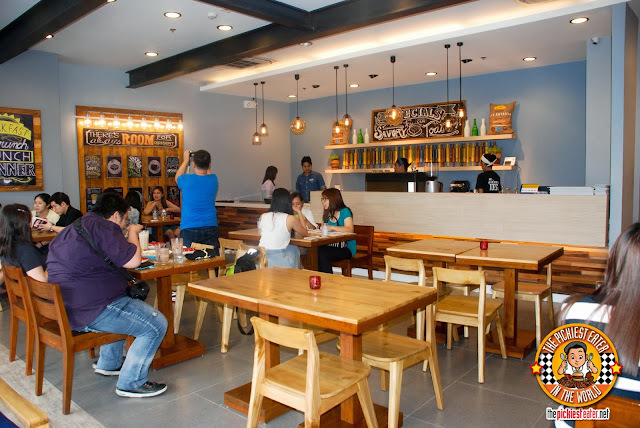 This restaurant is something to try on before the year ends! I wanna try that Shibuya Benedict!! The toast! Wow! Love the toast :) They serve lots of desserts. Hope to try there very soon.